Philosophy of education is a study both of the aims of education and the most appropriate means of achieving those aims. This volume contains substantial selections from those works widely regarded as central to the development of the field. These are the "essential texts" that lay the foundation for further study. The text is historically organized, moving from classical thought (Plato, Aristotle), through the medieval period (Augustine), to modern perspectives (Locke, Rousseau, Wollstonecraft), and twentieth-century thinkers (Whitehead, Dewey). Each selection is followed by an extended interpretative essay in which a noted authority of our time highlights essential points from the readings and places them in a wider context. 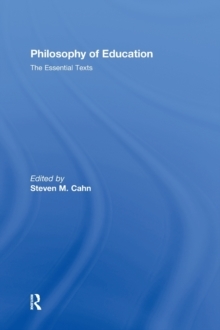 Exhibiting both breadth and depth, this text is ideal as a reader for courses in philosophy of education, foundations of education, and the history of ideas.